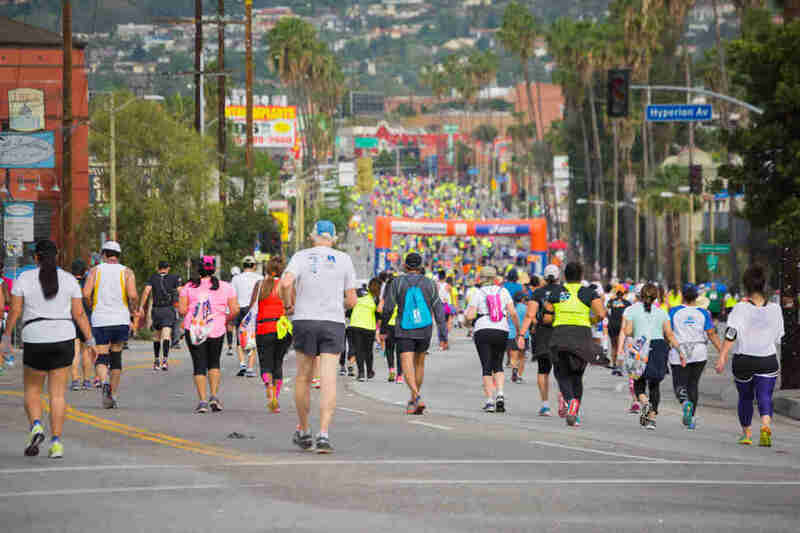 If there’s ever a doubt that our great City of Angels has something for everyone, look no further than the LA Marathon. During its 26.2-mile “From the Stadium to the Sea” course, participants pass by parks, lakes, historic theatres, architectural gems, concert halls, ornate cathedrals, Lamborghini dealerships, legendary live music venues, beaches, and the Museum of Death, all while accomplishing one badass feat of a lifetime. For those of us sitting this one out on Sunday, there are plenty of spots to cheer on our on-the-run counterparts, catch entertainment along the route, and even hit up a festival at the end. Here’s everything you need to know about race day whether you’re a runner, a spectator, or just someone trying to get to brunch on time. Where's the LA Marathon starting line? Dodger Stadium, baby, otherwise known as 2000 Academy Rd. Los Angeles, 90012. The race begins at 6:30am on Sunday, March 24, with the waves of runners taking off in order of wheelchairs at 6:30am, handcycles at 6:42am, elite women runners at 6:45am, and elite male runners plus the full field at 6:55am. What’s the best way to get to Dodger Stadium? If you’re actually participating in the marathon, this is an important one: Pre-race shuttles will be available from Union Station’s Bay 9 at Patsaouras Transit Plaza at 5am, 5:30am, and 6am, as well as Santa Monica City Hall every half hour between 3am and 5:30am. Shuttles will also be available from certain DTLA hotels if participants booked through the LA Marathon’s Hotel Reservation Center. 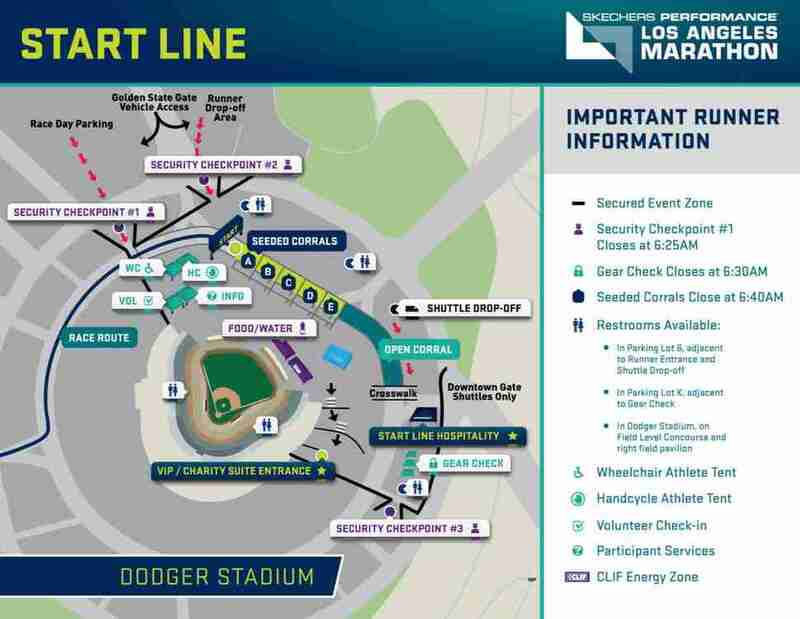 Dodger Stadium will be open to vehicular traffic on the morning of the race via the Golden State Gate, and while parking is allowed there, note that there won’t be a shuttle from the Westside finish line to get you back there, and cars must be retrieved by 8pm. Participants can also get dropped off at the Runner Drop-off Area in parking lot 4, accessed by the Golden State Gate. 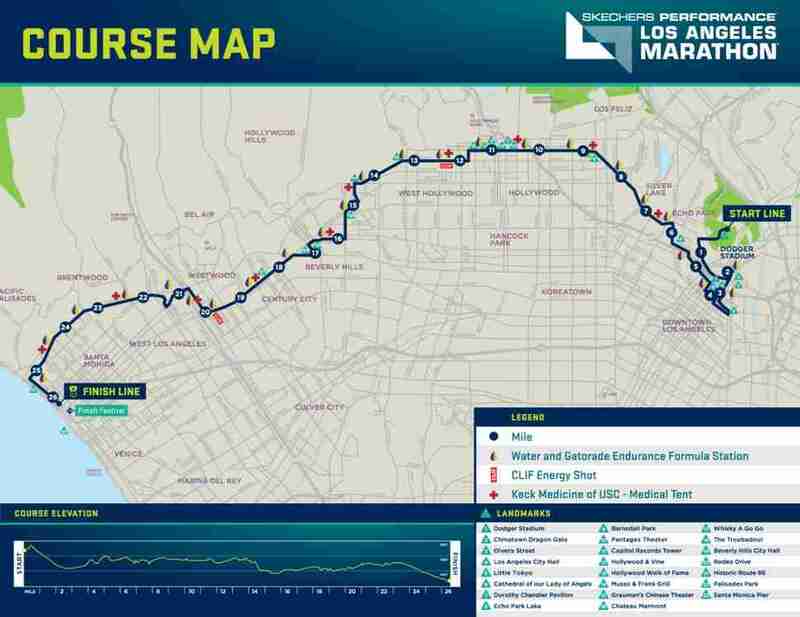 You can get a look at the course map here, but expect all twenty-four thousand runners to make their way west through Downtown, Silver Lake, Hollywood, WeHo, Beverly Hills, Westwood, West LA, and finally, Santa Monica. Each 1-mile checkpoint will correspond with a notable LA neighborhood or attraction, including Disney Concert Hall, the Hollywood Walk of Fame, and Rodeo Drive, ending at the finish line perched above the Pacific at the intersection of Ocean and California Avenues. What street closures will be in effect? There will be a dizzying number of cordoned-off streets, so check on them before you get in your car. Most of the closures between Downtown and Hollywood will start around 4am and be reopened between 10am and noon, while those between West Hollywood and the beach will start at 5am and reopened between 12:45pm and 2pm. Note that Ocean Avenue between San Vicente and Pico will close at midnight the night before the race and stay off-limits to drivers through 5pm on Sunday, while San Vicente between Ocean Avenue and Wilshire will be closed from 5am to 5pm. So, picture Santa Monica’s normal traffic snarls and multiply it by one million. What is the weather forecast for race day? It’s going to be pretty perfect temperature-wise, with a high of 72 and a low of 51 at Dodger Stadium that day, and a high of 69 and low of 54 in Santa Monica, so expect it to probably be in the mid to high 50s when the race kicks off and in the mid 60s over by the beach when the first set of finishers starts rolling in. There’s also zero percent chance of rain, and while the runners might appreciate a little cloud cover, it’s looking like sun, sun, and more sun. What if I want to do a run that’s about 23 miles less than the actual marathon? You’re in luck. 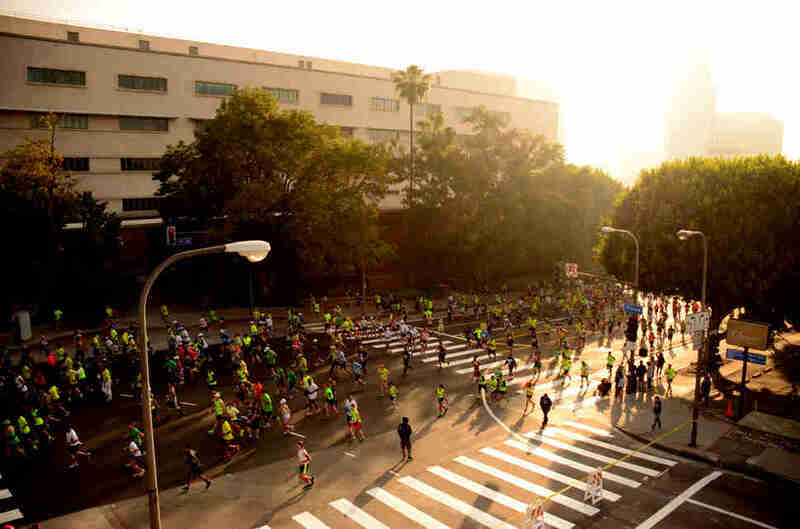 The LA Big 5K takes place the morning before the marathon at 8am, and is open to pretty much everyone (including walkers and stroller pushers). 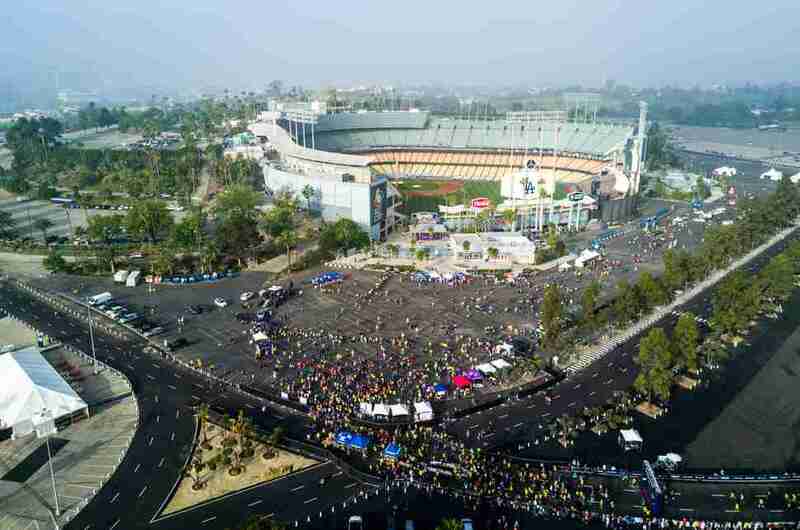 The run begins at the same starting line at the stadium and winds through Elysian Park before circling back around the stadium. All participants (you can register here) will get a shirt, medal, and post-race refreshments. This year: 5K. Next year: Full-blown marathon. Or something like that. Is there a charity element to the marathon? Yep. There are tons of partner charities affiliated with the race, as wells as runners who will be pounding the pavement to raise money for lots of local good causes -- from pit bull rescue to suicide prevention to support services for individuals with Alzheimer’s. You can take a look at the participating charities and make a donation right on the LA Marathon site. Where should I watch the race? If you’re planning on cheering the runners live, there are lots of options, including staking out a spot at one of these landmarks spread throughout the course. Ocean Avenue, north of Washington Avenue, in Santa Monica, near the finish line. Also, keep an eye out for bands, entertainment and “cheer stations” at dozens of points along the course. How do I get the results and track LA Marathon runners? Download the LA Marathon’s handy-dandy app where you can get race results and even enter the name participants to find out their times. (Though are you really going to admit to Greg in sales that you know he didn’t finish under four hours?). There’s lots of other pertinent marathon info, too, like a course map, points of interest along the route, social posts, and day-of updates. What’s happening before the marathon? There’s a Health & Fitness Expo at the LA Convention Center Downtown (1201 S. Figueroa Street) on Friday from 10am to 7pm, and Saturday from 9am to 5pm. It’s here participants can pick up their packets (don’t forget your ID) and check out more than 120 exhibitor booths showing off fancy running gear, shoes, tech, and other products centered around fitness and nutrition. The show is free and open to the public. What’s happening after the marathon? 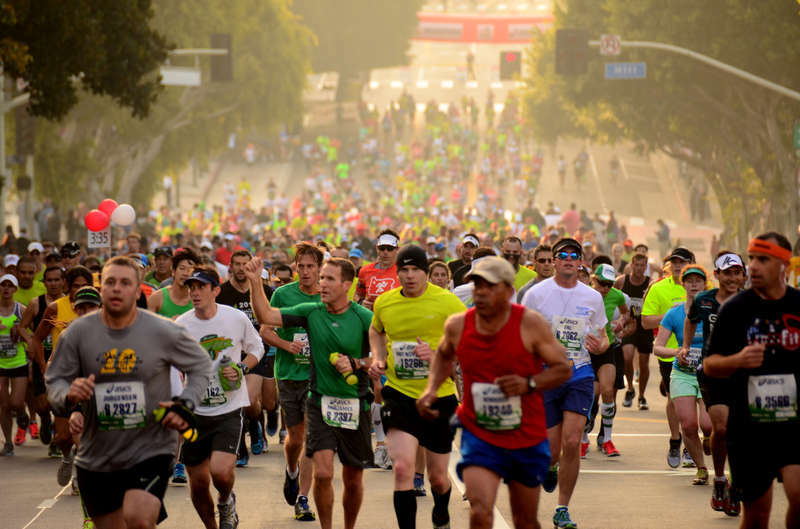 Check out the Finish Festival, a post-race celebration running from 9am to 3pm at the intersection of Santa Monica Boulevard and 2nd Street, slated to include music, entertainment, and giveaways in addition to the Angel City Brewery Beer Garden. What freebies will participants get once they’ve crossed the finish line? As Oprah always says, You get a massage and you get a massage and you get a massage! How they’re going to actually perform 24,000 massages, we have no idea, but indeed everyone who completes the race is entitled a complimentary one at the Massage Tent located Ocean Avenue just south of Broadway. Then it’s time to drink: Runners (who are 21 and over) can grab their free brew between 10am and 2:30pm inside the Beer Garden. To get it, you’ll either need to pick up a wristband at the Health & Fitness Expo or show your ID at the Beer Garden entrance. And if you see any runners wandering around the tent empty-handed, for God’s sake, buy them one -- they just ran here from Dodger Stadium. Lizbeth Scordo is a food and lifestyle writer who has never run a marathon, run for office, nor run a company. She’s suddenly feeling like a complete failure. Watch her downward spiral on Instagram @modlizbeth and Twitter @lalizbeth.